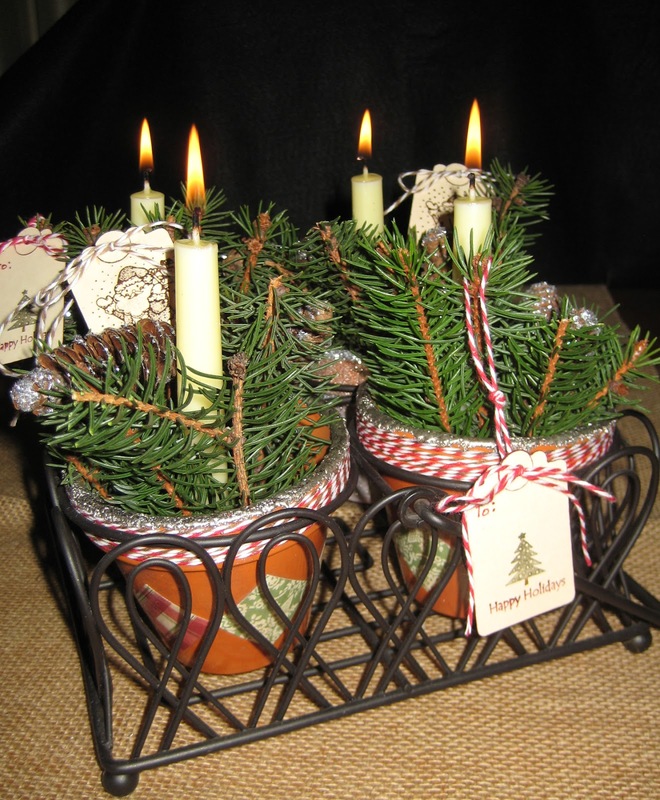 This is a great little holiday table-top decor item I made recently and I'm going to show you just how easy it was to make. As a kid, I used to love to decoupage. We made our own glue from flour and water and used torn up newspapers for most projects or cut pictures out of magazines. As an adult (some people might argue that point), I still love to decoupage but my materials have gotten a little more sophisticated. This project is so easy and there's plenty of time to make these before Christmas. I started with four small terracotta flower pots and a black metal display rack I had around the house. The rack originally held little metal buckets so I made sure the pots fit the rack before starting. I gathered my materials - mostly from my backyard! 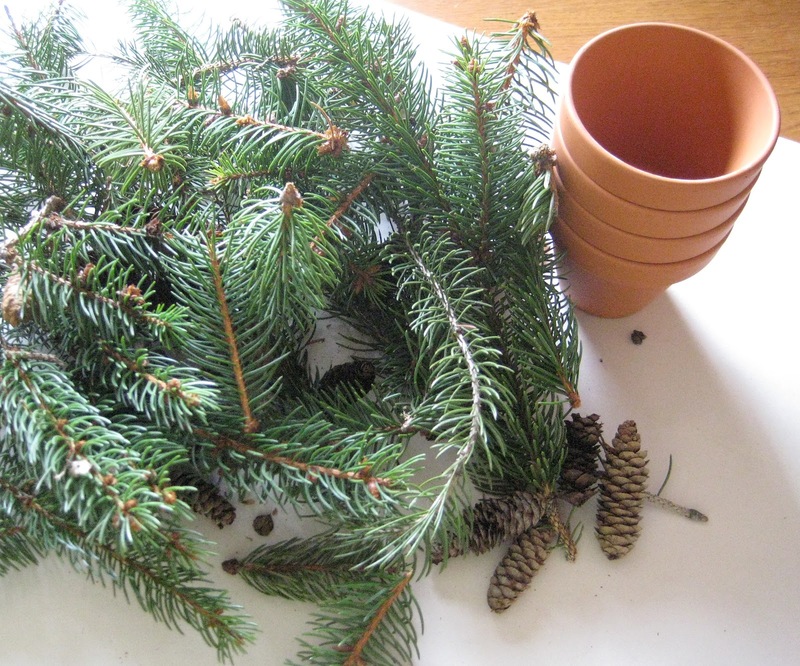 I took the scissors outdoors and didn't even need them - other than the pots, this stuff was just laying all over the ground! 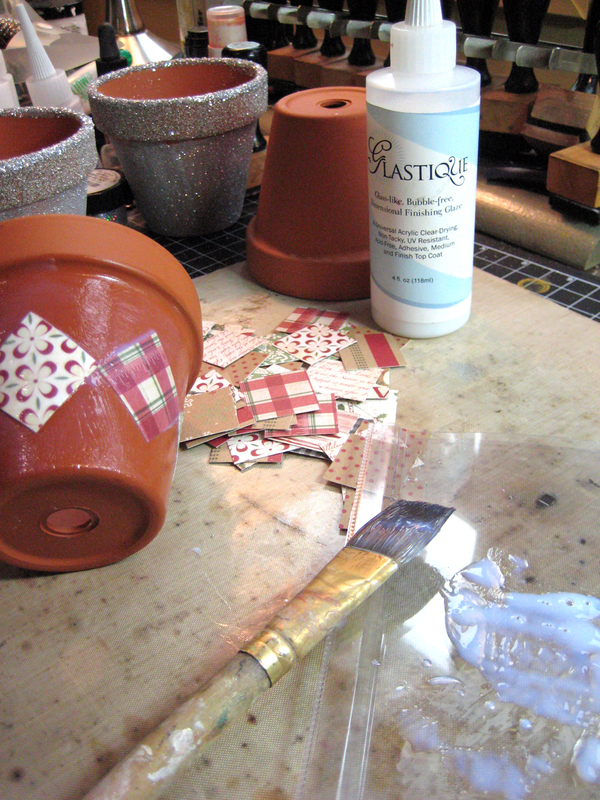 Glastique Finishing Glaze (Gloss) - works so much better than flour and water concoction! I took the Christmas scrapbook paper and paper trimmer and cut a bunch of 1-inch by 1-inch squares of various patterns. Poured a small puddle of Glastique onto a palette (scrap packaging) and used the paint brush to paint a coat of Glastique on a section of the terracotta pot. I did a space just large enough to fit a 1-inch paper square. I could be a little generous, but not sloppy, with painting the Glastique on. I then pressed a paper square into the painted area (I chose to place my squares on an angle so it looks more like a diamond). Then brush another coat of Glastique over the paper square, brushing it flat against the pot so all edges lay nice and flat. I continued this technique all the way around the pot. It just so happened the diamonds met perfectly corner-to-corner! I was just going to cover the connection with an embellishment if it didn't work out, but that wasn't necessary. 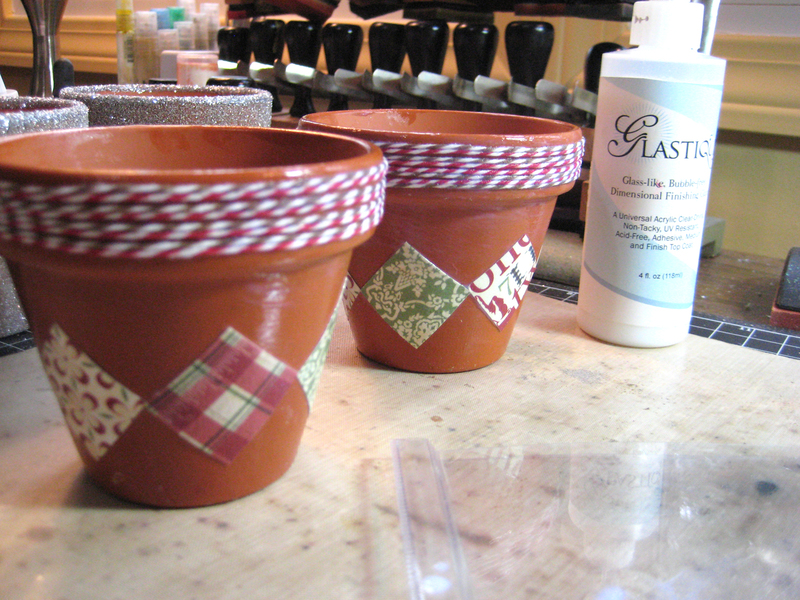 I completed both pots, cleaning the brush periodically in the water so it wouldn't stiffen. When I finished adhering the paper I used basically the same technique to attach the twine. I brushed the broad rim with the Glastique and wrapped the twine around it, adding more Glastique when needed. While one pot is sitting to dry I'm finishing the second one. I added a second and third coat of Glastique to the pots when dry and continued back-and-forth till I was pleased with the results. Glastique works as the glue as well as the sealer for this project. I used gloss to get the nice shiny finish. The matte could be used here and would work just as well. 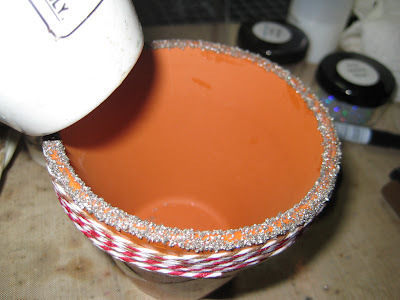 I wanted to add some shimmer and shine to the rim top so swiped it with my bottle of Enamel Powder Adhesive. It's in a dabber bottle, which makes it so easy to apply. I then spooned on the Vintage Silver Enamel Powder and heat set. There's about 2-3 coats on the rim and I just kept adding more powder and heating it till I got the look I wanted. Cool, eh? I punched a tag and stamped it with a Christmas-themed stamp, colored and edged it with the Tombow pens and attached it with the twine. I brushed the pine cones with the Glastique and dipped them in silver glitter and set aside to dry. 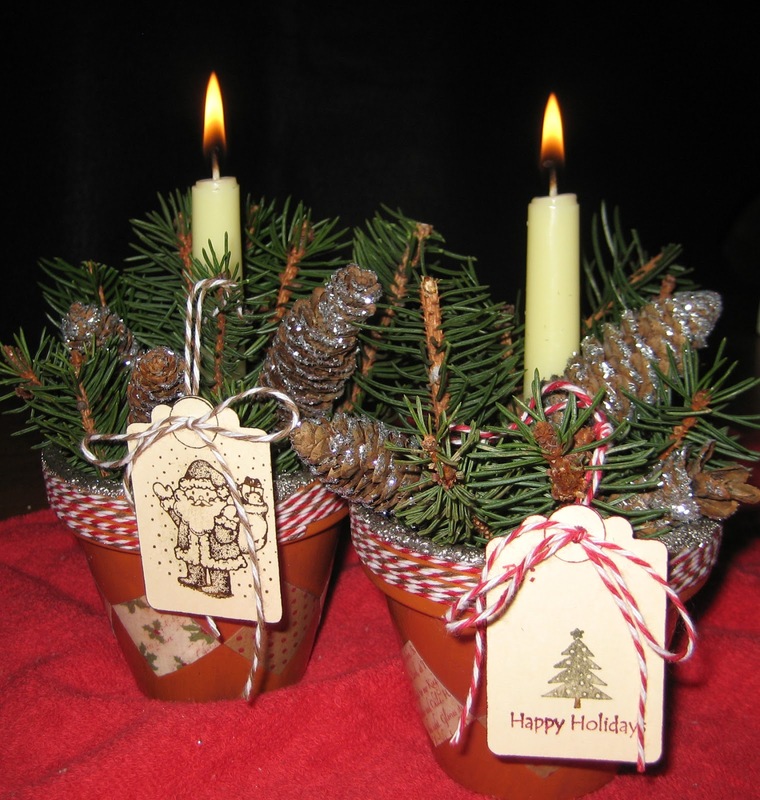 I trimmed the greenery and tucked it into the pot, setting a candle into the center and adding the glittered pine cones. My pots sit together in the black metal carrier but these would make great name holders at a dinner table and guests could take them home with them. I'm sure I'll be trying some more decoupage projects with Glastique soon. 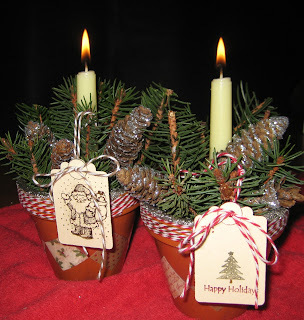 Visit my blog today to see one of our DIY Ornaments all decked out for Christmas! Such a great idea! 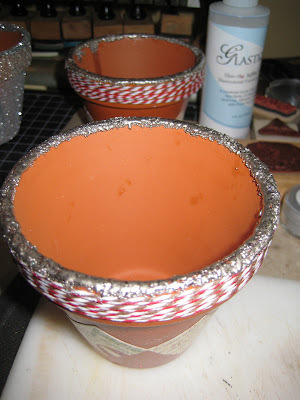 I never thought to use the enamel powders on plain ol' pots.